Alpha-Tocopherol and gamma-tocopherol are the two major forms of vitamin E in human plasma and the primary lipid soluble antioxidants. The dietary intake of gamma-tocopherol is generally higher than that of alpha-tocopherol. However, alpha-tocopherol plasma levels are about four fold higher than those of gamma-tocopherol. Among other factors, a preferential cellular uptake of gamma-tocopherol over alpha-tocopherol could contribute to the observed higher plasma alpha-tocopherol levels. In this investigation, we studied the uptake and depletion of both alpha-tocopherol and gamma-tocopherol (separately and together) in cultured RAW 264.7 macrophages. Similar studies were performed with alpha-tocopheryl quinone and gamma-tocopheryl quinone, which are oxidation products of tocopherols. 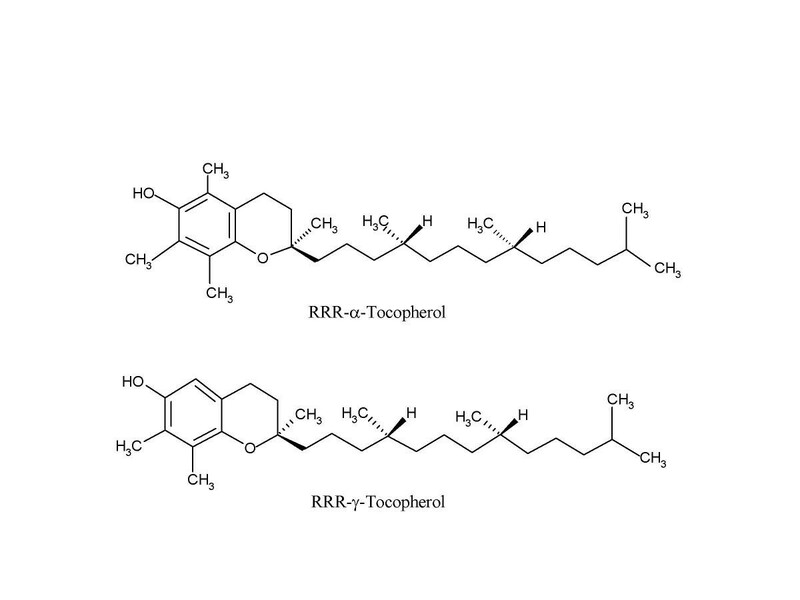 RAW 264.7 macrophages showed a greater uptake of gamma-tocopherol compared to alpha-tocopherol (with uptake being defined as the net difference between tocopherol transported into the cells and loss due to catabolism and/or in vitro oxidation). Surprisingly, we also found that the presence of gamma-tocopherol promoted the cellular uptake of alpha-tocopherol. Mass balance considerations suggest that products other than quinone were formed during the incubation of tocopherols with macrophages. Our data suggests that gamma-tocopherol could play a significant role in modulating intracellular antioxidant defence mechanisms. Moreover, we found the presence of gamma-tocopherol dramatically influenced the cellular accumulation of alpha-tocopherol, i.e., gamma-tocopherol promoted the accumulation of alpha-tocopherol. If these results could be extrapolated to in vivo conditions they suggest that gamma-tocopherol is selectively taken up by cells and removed from plasma more rapidly than alpha-tocopherol. This could, in part, contribute to the selective maintenance of alpha-tocopherol in plasma compared to gamma-tocopherol. Vitamin E is an essential nutrient, the main lipid soluble antioxidant, and plays a significant role in protecting biological membranes and lipoproteins from damage caused by free radicals generated during lipid peroxidation [1–3]. Recent information suggests that vitamin E also has functions unrelated to its role as an antioxidant . Vitamin E is often equated only with alpha-tocopherol since this form is the most potent in protecting the fetuses of pregnant female rats from death and resorption. Vitamin E is, however, not a single compound and refers to at least four tocopherols (alpha-, beta-, delta- and gamma-tocopherol) and four tocotrienols (alpha-, beta-, delta- and gamma-tocotrienol). Alpha-tocopherol and gamma-tocopherol (see Figure 1) are the two major forms of vitamin E found in human plasma and tissues. Under in vitro conditions, alpha- and gamma-tocopherol have very similar abilities to inhibit lipid peroxidation in large unilamellar liposomes . The dietary intake of gamma-tocopherol is at least two times that of alpha-tocopherol in Western diets. The levels of alpha-tocopherol in human plasma are, nevertheless, about four times higher than those of gamma-tocopherol. The chemical structures of RRR-alpha- and RRR-gamma-tocopherol The structures shown have the three chiral methyl groups in the R configuration. Both alpha- and gamma-tocopherol are absorbed from the intestine and secreted into chylomicrons equally well [6, 7]. The selective retention of alpha-tocopherol in plasma is attributed to a number of factors such as the hepatic alpha-tocopherol transfer protein (alpha-TTP), which preferentially incorporates alpha-tocopherol (over gamma-tocopherol) into very low density lipoprotein [8–10]. Indeed, the affinity of the different forms of vitamin E for the alpha-TTP protein appears to be a primary determinant of their plasma levels . In addition, there is evidence suggesting that gamma-tocopherol is preferentially catabolized to a water-soluble form (2,7, 8-trimethyl-2-(beta-carboxyethyl)-6-hydroxychroman or gamma-CEHC) by side chain oxidation [11, 12]. It is also possible that a more rapid cellular uptake of gamma-tocopherol (and removal from plasma) could contribute to the preferential maintenance of alpha-tocopherol in plasma. A more rapid cellular accumulation of gamma-tocopherol (compared to alpha-tocopherol) would also have major physiological consequences. The protection of subcellular organelles and cellular DNA from free radical damage is likely to be primarily dependent upon intracellular vitamin E levels as opposed to plasma vitamin E levels. Surprisingly, there have been very few studies comparing the cellular uptakes of alpha- and gamma-tocopherol. 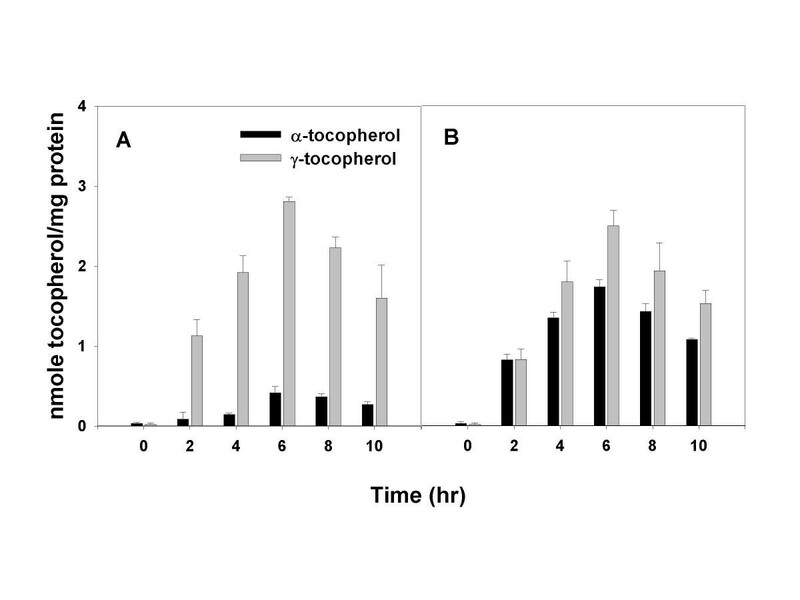 Tran and Chan  found a preferentially uptake (three fold higher after four hours of incubation) of gamma-tocopherol compared to alpha-tocopherol in cultured human umbilical endothelial cells. In contrast, Jiang et al. found a similar incorporation of both alpha- and gamma-tocopherol into RAW264.7 macrophages and only a slightly higher (30%) incorporation of gamma-tocopherol (compared to alpha-tocopherol) in A549 endothelial cells. In this investigation, we studied the uptake and depletion of alpha-tocopherol and gamma-tocopherol as well as their quinone oxidation products (see Figure 2) by RAW264.7 murine macrophages. There are no previous studies on the cellular uptake tocopheryl quinones. We found that gamma-tocopherol was taken up more rapidly and accumulated to higher levels than alpha-tocopherol in RAW264.7 macrophages. In addition, we found that presence of gamma-tocopherol dramatically increased the cellular uptake of alpha-tocopherol. We also describe a novel high pressure liquid chromatography (HPLC) method for simultaneously separating and quantifying levels of alpha-tocopherol, alpha-tocopheryl quinone, gamma-tocopherol and gamma-tocopheryl quinone. The chemical structures of RRR-alpha- and RRR-gamma-tocopheryl quinones The structures shown have the three chiral methyl groups in the R configuration. RPMI-1640 medium without phenol red, cell culture freezing medium containing DMSO, fetal bovine serum (FBS), penicillin, streptomycin, 7.5% bovine serum albumin (BSA), phosphate buffer saline (PBS, pH = 7.4), and trypan blue were purchased from Life Technologies (Grand Island, NY). Rac-5,7-dimethyl tocol was purchased from Matreya (Pleasant Gap, PA). Alpha-tocopherol was obtained from Eastman (Kingsport, TN) and gamma-tocopherol was obtained Tama Biochemical Co. (Tokyo, Japan). Alpha-tocopheryl quinone and gamma-tocopheryl quinone were synthesized as described below. RAW 264.7 murine macrophages (American Type Culture Collection, Rockville, MD) were cultured at 37°C in a humidified incubator (95 % air with 5% CO2) in RPMI-1640 medium with 10 % fetal bovine serum (FBS), 50 units/ml penicillin, and 50 mg/ml streptomycin (culture medium). A 50 μl aliquot of tocopherol (or tocopheryl quinone) solution in ethanol was placed in glass tube and dried under N2. After the addition of 1.0 ml of 7.5% BSA the mixture was vortexed for 2 min, 74.0 ml culture medium added, and the mixture vortexed again for 2 min. The final concentration of tocopherol (or tocopheryl quinone) in the culture medium was determined by HPLC (see below). To define the time course of tocopherol (or tocopheryl quinone) accumulation, adherent cells (2 × 106/well) were subcultured in 12 well falcon tissue culture plates with medium enriched with about 5 μM tocopherol (or about 0.5 μM quinone) (3 ml/well). After 6 hr (the uptake phase), the medium was replaced with fresh medium without tocopherol (or quinone) and the depletion of tocopherols (or quinones) followed for an additional 4 hours (the depletion phase). During the course of the cell culture experiment, a 400 μl aliquot of medium was removed every 2 hr and placed in a glass vial for tocopherol (or quinone) measurement and the remaining medium removed. The adherent cells in the well were washed three times with 1.0 ml of PBS, and the cells overlaid with 400 μl of lysis buffer (1% Triton X-100 in pH 7.5, 20 mM HEPES buffer with 0.1 mM EDTA), scraped, and collected into a glass vial for tocopherol analysis by HPLC, and for protein determination by the BCA protein assay (Pierce, Rockford, IL). For each experiment, three wells were used per time point and each experiment was performed in duplicate. Statistical comparisons were made by use of the Student's t-test. The medium sample (or cell sample) was mixed with 1.0 ml ethanol and 1.0 ml hexane containing 10 μg/ml 2,6-di-tert-butyl-4-methylphenol (BHT), and rac-5,7-dimethyl tocol as an internal standard. The rac-5,7-dimethyl tocol internal standard was found to be very useful since it did not elute in the same position as gamma-tocopheryl quinone as does tocol (2-methyl-2-(4,8,12-trimethyltridecyl)chroman-6-ol) which is typically used as an internal standard. After vortexing, the mixture was centrifuged at 1020 × g for 5 min, and a 400 μl aliquot of the upper layer removed, dried under N2, and taken up in 100 μl of mobile phase. The mobile phase was methanol: water (90:10) containing 3 FM EDTA and 20 mM ammonium acetate, pH 4.4. The tocopherol (or tocopheryl quinone) was measured using a HPLC equipped with a Coulochem II Electrochemical Detector, a ESA Model 580 Solvent Delivery Module, a Column Catecholamine HR-80 (C18, 3 mm, 8 cm), a Model 5011 Analytical Cell, a Model 5020 Guard Cell (Chelmsford, MA), a PE Nelson 900 Series Interface with PE Nelson Turbochrom V4 software (Perkin Elmer, San Jose, CA). The flow rate was adjusted to 1.5 ml/min with E1 = -600 mV (the first analytical cell potential), E2 = 400 mV (the second analytical cell potential and E3 = 300 mV (the conditioning cell potential). The response factors of tocopherols (or tocopheryl quinones) relative to tocol were determined in triplicate. The concentrations of alpha-tocopherol, gamma-tocopherol, rac-5,7-tocol, alpha-tocopheryl quinone, and gamma-tocopheryl quinone in the standard solutions were measured using a Spectronic 3000 Array Spectrometer (Milton Roy, Rochester, NY) and published extinction coefficients . FeCl3·6H2O (1360 mg) was dissolved in 30 ml ethanol, and 530 mg of alpha-tocopherol (or gamma-tocopherol) was dissolved in 40 ml ethanol. Both solutions were mixed and placed in water bath at 50°C. After 3 hr, a 35 ml aliquot of the reaction mixture was placed in a separatory funnel, mixed with 50 ml of ether, washed with 50 ml of water, then washed with 50 ml of 0.15 M EDTA to chelate Fe ions. After the ether layer was dried by evaporation in a rotary evaporator, the crude quinone oil was dissolved in 10 ml ethanol and stored in a freezer at -20°C. The crude sample of tocopheryl quinone was purified using a HPLC system equipped with a Dynamax PC UV-M Multiple Wavelength Detector (Rainin, Woburn, MA), a model 2350 HPLC Pump, a C18 Column (5 mm, 250 mm) (ISCO, Lincoln, NE). Confluent RAW264.7 macrophages were incubated with either 5.6 μM alpha-tocopherol or 4.9 μM gamma-tocopherol (Figure 3A) or with both tocopherols together (Figure 3B with alpha-tocopherol at 4.6 μM and gamma-tocopherol at 5.2 μM) and the uptake of tocopherols measured during 6 hours of incubation. Uptake is defined as the net difference between tocopherol transported into the cells and loss due to catabolism and/or in vitro oxidation. After 6 hours, the medium with tocopherols was removed and replaced with medium not containing tocopherols and depletion of tocopherols followed for 4 hours. The uptake and depletion of alpha- and gamma-tocopherol separately (A) and together (B) by RAW264.7 Macrophages. Confluent RAW264.7 macrophages were incubated with either 5.6 μM alpha-tocopherol or 4.9 μM gamma-tocopherol (A) or with both tocopherols (4.6 μM alpha- plus 5.2 μM gamma-tocopherol) together (B) and the uptake of tocopherols measured during 6 hours of incubation. After 6 hours, the medium with tocopherols was removed and replaced with medium not containing tocopherols and depletion of tocopherols followed for 4 hours. Tocopherols in the medium and cells were immediately determined by HPLC with an electrochemical detector as described in the Methods section. Values are the means ± SD of three wells. Each experiment was performed twice with excellent reproducibility. After 6 hours of incubating macrophages with either alpha- or gamma-tocopherol (Figure 3A), the intracellular levels of gamma-tocopherol were at least six fold higher than the levels of alpha-tocopherol (p < 0.001). A major goal of this research was to determine if alpha-tocopherol and gamma-tocopherol interacted with each other so as influence their uptake and depletion. Figure 3B shows the uptake and depletion of alpha-tocopherol and gamma-tocopherol when both were incubated together with macrophages. It is clear (compare Figure 3A to 3B) that the presence of gamma-tocopherol considerably enhanced the uptake of alpha-tocopherol (p < 0.001). The presence of alpha-tocopherol did not, however, markedly enhance the uptake of gamma-tocopherol. After washing with fresh medium without tocopherols, the macrophage levels of both alpha-tocopherol and gamma-tocopherol decreased, but the depletion of gamma-tocopherol was always faster than that of alpha-tocopherol. The changes in tocopherol levels (expressed as nmoles/well) in the medium were also measured during both the uptake and depletion phases and these data are provided in Tables 1 (for alpha-tocopherol or gamma-tocopherol) and 2 (for alpha-tocopherol plus gamma-tocopherol). In order to make meaningful comparison, Tables 1 and 2 also provide the cell content of tocopherols expressed as nmoles/well. The data in Tables 1 and 2 indicate that only a small percentage of the tocopherols lost from the medium during the uptake phase are recovered in the macrophages. This suggests that a considerable amount of tocopherol is lost during incubation by catabolism/oxidation. The recovery of alpha-tocopherol during the uptake phase was, however, greater when gamma-tocopherol was present. It is interesting that the depletion of alpha-tocopherol from the medium during the uptake phase was always greater than that of gamma-tocopherol yet the cellular uptake of gamma-tocopherol was always greater than that of alpha-tocopherol. Tables 1 and 2 also indicate that gamma-tocopherol decreases from RAW264.7 macrophages more rapidly than alpha-tocopherol during the depletion phase. Tocopheryl quinones (see Figure 2) are likely products formed by the oxidation of tocopherols. Table 3 shows the initial distribution of alpha-tocopherol or gamma-tocopherol and their quinone products both in the medium and in cells as well as the distribution after 6 hr of incubation in the cell system. These data show that the nmoles of tocopherol that accumulated in cells after 6 hr is very small compared to the amount in the medium. For the data in Table 3, for example, the original amount of alpha-tocopherol in the medium was 17.0 nmole/well, but the amount present in cells after 6 hr was just 0.16 nmole/well, i.e., less than 1.0% of the original amount in the medium. The original amount of gamma-tocopherol was 14.8 nmole/well, and the amount present in cells after 6 hr was 0.86 nmole/well, which is 5.8% of the original amount in the medium. If tocopheryl quinones were the only catabolic/oxidation products formed during incubation with the macrophages, then the nmoles of tocopherol plus the nmoles of tocopheryl quinone in the medium and in the cells should be constant. Table 3 clearly shows that the sum of the tocopherol and its quinone product decreased over the 6 hr experiment suggesting that products, other than the tocopheryl quinone, were formed during the experiment. 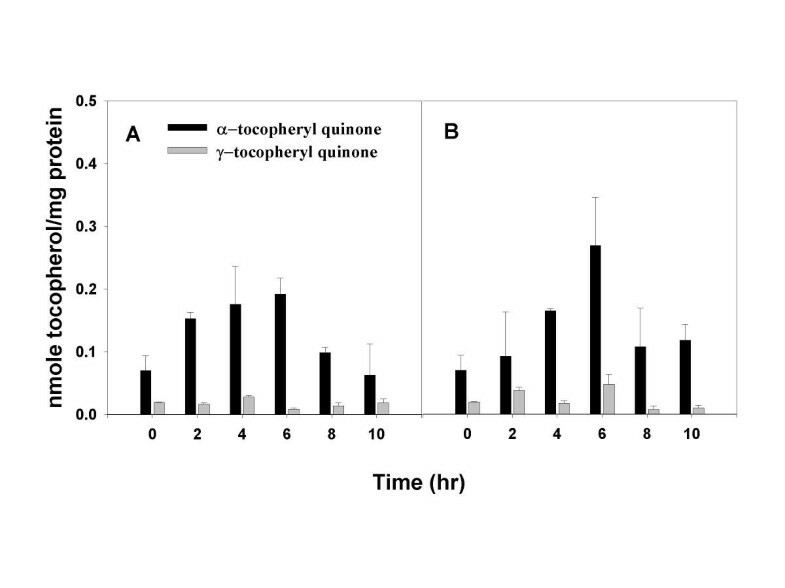 Moreover, these data show that after 6 hr of incubation: (1) cellular alpha-tocopheryl quinone levels were generally higher than those of gamma-tocopheryl quinone; (2) cellular tocopheryl quinones levels were always much lower than cellular tocopherol levels. This latter point suggests that the low cellular levels of alpha-tocopherol (compared to gamma-tocopherol levels) shown in Figure 3A, as compared to Figure 3B, cannot be explained by the simple cellular oxidation of alpha-tocopherol to alpha-tocopheryl quinone (with no further catabolism or oxidation). After 6 hr, macrophages incubated with both alpha- and gamma-tocopherol accumulated about 0.5 nmole more alpha-tocopherol than did macrophages incubated with alpha-tocopherol alone. If, in the absence of gamma-tocopherol, 0.5 nmole of alpha-tocopherol were converted to alpha-tocopheryl quinone (and no further catabolism occurred) than this should be recovered in cells. The data in Table 3 indicate, however, a cellular accumulation of only about 0.03 nmoles of alpha-tocopheryl quinone. Moreover, macrophages actually had a lower content of alpha-tocopheryl quinone when incubated with alpha-tocopherol alone then when incubated with both alpha- and gamma-tocopherol together. Although gamma-tocopherol promotes the cellular uptake of alpha-tocopherol, it clearly did not do so by dramatically protecting alpha-tocopherol from oxidation to alpha-tocopheryl quinone (with no further catabolism/oxidation of alpha-tocopheryl quinone). RAW 264.7 macrophages were incubated with 0.6 μM alpha-tocopheryl quinone or 0.4 μM gamma-tocopheryl quinone alone (Figure 4A) or with both together (Figure 4B with 0.6 μM alpha-tocopheryl quinone and 0.4 μM gamma-tocopheryl quinone) and the uptake and depletion measured as described above. Figure 4 indicates that alpha-tocopheryl quinone accumulates to higher levels than gamma-tocopheryl quinone (e.g. at 6 hours the difference is significant at p < 0.001). Similarly, alpha-tocopheryl quinone was lost from the cells more rapidly during the depletion phase. These results are consistent with those in Table 3, which always indicate a higher intracellular concentration of alpha-tocopheryl quinone compared to gamma-tocopheryl quinone. 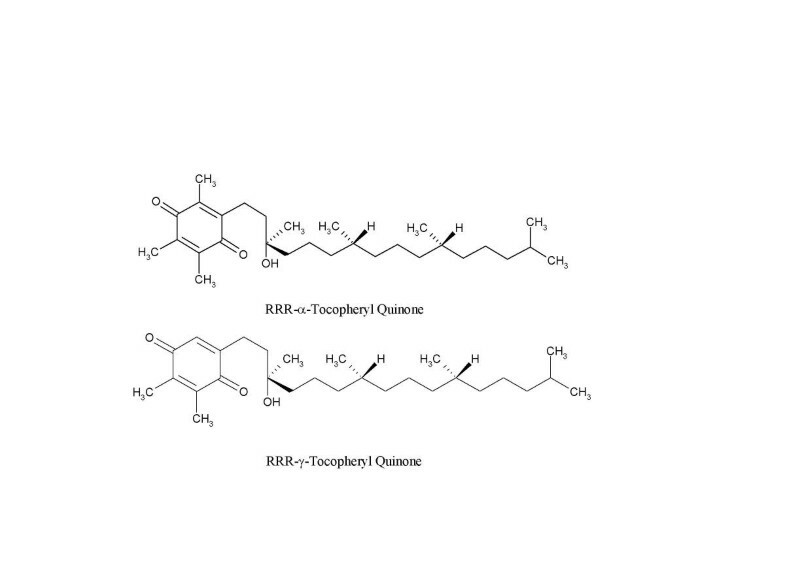 The uptake and depletion of alpha- and gamma-tocopheryl quinone separately (A) and together (B) by RAW264.7 Macrophages. Confluent RAW264.7 macrophages were incubated with either 0.6 μM alpha-tocopheryl quinone or 0.4 μM gamma-tocopheryl quinone (A) or with both quinones (0.6 μM alpha- plus 0.4 μM gamma-tocopheryl quinone) together (B) and uptake measured during 6 hours of incubation. After 6 hours, the medium was removed and replaced with medium not containing quinones and quinone depletion followed for 4 hours. Tocopheryl quinones in the medium and cells were immediately determined by HPLC with an electrochemical detector as described in the Methods section. Values are the means ± SD of three wells. Each experiment was performed twice with excellent reproducibility. Table 4 shows the initial distribution of alpha-tocopheryl quinone or gamma-tocopheryl quinone in both the medium and cells and the distribution after 6 hr of incubation with each quinone separately or both quinones together. Only a very small fraction of the gamma-tocopheryl quinone lost from the medium was taken up by the RAW264.7 macrophages, i.e. 2 % when gamma-tocopheryl quinone was incubated by alone and 2 % when gamma-tocopheryl was incubated along with alpha-tocopheryl quinone. In the case of alpha-tocopheryl quinone there was substantially greater recovery, i.e. 23 % when alpha-tocopheryl alone was incubated with the macrophages and 35 % when alpha-tocopheryl quinone was incubated along with gamma-tocopheryl quinone. The data in Table 4 clearly show that gamma-tocopheryl quinone was oxidized and/or catabolized more rapidly than alpha-tocopheryl quinone. The data in Table 4 also indicate that cellular quinone uptake of was not influence by an interaction between alpha- and gamma-tocopheryl quinones. Our results consistently show that gamma-tocopherol was taken up more rapidly and accumulated to higher intracellular levels than alpha-tocopherol. Moreover, the presence of gamma-tocopherol markedly promoted the uptake of alpha-tocopherol by macrophages. When macrophages were incubated with alpha-tocopherol or gamma-tocopherol individually, the macrophage level of alpha-tocopherol was just 10–20% of that of gamma-tocopherol (Figure 3A). In marked contrast, when macrophages were incubated with both alpha- and gamma-tocopherols together the cellular level of alpha-tocopherol were 70–80% (after 6 hr) that of gamma-tocopherol (Figure 3B). There were no marked changes in the levels of gamma-tocopherol caused by the presence of alpha-tocopherol. Tocopherol quinones were considered to be likely oxidization products of the tocopherols. The increased cellular uptake of alpha-tocopherol caused by gamma-tocopherol could be caused by gamma-tocopherol protecting alpha-tocopherol from in vitro oxidation to its quinone form. However, the data in Table 3 show that gamma-tocopherol does not slow the oxidation of alpha-tocopherol to alpha-tocopheryl quinone. In the presence of gamma-tocopherol, the cellular levels of alpha-tocopheryl quinone were even higher than in its absence (Table 3). It is possible, however, that gamma-tocopherol may protect alpha-tocopherol from catabolism (or in vitro oxidation) into products other than quinones. The data in Table 3 certainly suggest that products, other than quinones, were produced when the macrophages were incubated with tocopherols. Those metabolites could very possibly be water-soluble products, such as alpha-CEHC or gamma-CEHC that were not measured in this investigation. It is not clear why our result differ from those reported by Jiang et al. who also measured the uptake of alpha- and gamma-tocopherol separately in RAW264.7 macrophages (but not both together). Since gamma-tocopherol is depleted from macrophages more rapidly than alpha-tocopherol the time interval between removal of the tocopherol enriched medium and cell harvesting could be an important variable. Our results are, however, qualitatively very similar to those reported by Tran and Chen  for human endothelial cells although these investigators did not directly compare the results from incubating cells with alpha-tocopherol and gamma-tocopherol separately or together. When macrophages were incubated tocopheryl quinones (see Figure 4), the cellular levels of alpha-tocopheryl quinone were always found to be higher than that of gamma-tocopheryl quinone (independent of the presence of gamma-tocopheryl quinone). The data in Table 4 suggest that alpha-tocopheryl quinone is fairly stable in the cell incubation system compared to gamma-tocopheryl quinone. It is not known if the in vitro results of this study are relevant to the in vivo conditions. It is interesting, however, that in an animal model, graded levels of dietary gamma-tocopherol in a diet containing a constant level of alpha-tocopherol were found to increase the levels of alpha-tocopherol in serum and most tissues . This remarkable result has yet to be reproduced in humans but certainly suggests an interaction between dietary gamma-tocopherol and alpha-tocopherol similar to that reported here on the cellular level. The potential health related significance of gamma-tocopherol is being increasingly recognized . This research was supported by stipends from the Chemistry and Pediatrics Departments at East Tennessee State University.